At the UK National Cyclo-cross Championships at Cyclopark, Gravesend, Joe Kiely won a Bronze medal having finished third in the under 16 boys race after a seat-post mishap, Euan Woodliffe took a well earned 10th place, Nathan Hardy finished 59th and Caelen Miller 60th in a large field. 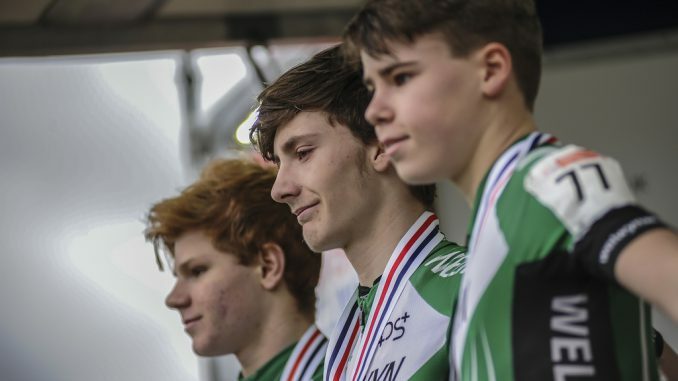 The Wheelers all rode well and the leading trio won the Youth A Boys Team Championship prize – and with Euan, Nathan and Caelen all being Youth A ‘first years’, surely the potential to retain it next year. Joe had a plan to get to the front and push on. Better to be on the front with all the turns. He led for half of the 1st lap. Then he exchanged turns of trying to rip each other’s legs off with Finn Pickering and eventual winner Corran Carrick-Anderson. The 2nd part of the plan was to be on front for last time up the steep climb and technical section before finish straight. Unfortunately coming up to the finish line on the penultimate lap his seat post slipped all the way down. He immediately started to lose ground and by the time he got to the pits for new bike the gap to the leaders was too big. He managed to hang on for 3rd, although he felt pretty down for a while. A night’s sleep allowed some philosophical revaluation. The main point being that you cannot truly enjoy the highs without suffering the lows. In the U14s categories Mark Lightfoot was 10th, Calum Moir 17th and Dylan Starkey 43rd while Millie Coleman and Beth Bennett finished in 15th and 40th place respectively in the girls race. The two Wheelers riders in the junior men’s race, Louis Sutton and Archie Peet, finished in the middle of the 55-strong pack, won by the World Champion, Ben Tullett. Cyclopark put on an excellent two-day Championships that attracted large crowds that created a great atmosphere. We look forward to a possible UCI World Cup event one day in the future – and hope it rains beforehand. Sundays races were all broadcast live by British Cycling and can be enjoyed again on YouTube.